>> I want to remind everyone of the Sun’nFun Aerospace Educators Workshop, this Saturday, April 8th, in Lakeland, Florida….It is an amazing day and the evening program will include fireworks with a night air show. https://visitcentralflorida.org/blog/sun-n-fun-international-fly-in-expo <https://visitcentralflorida.org/blog/sun-n-fun-international-fly-in-expo> ...registration form is below….I will be doing two presentations on Sat morning…it is where I have met so many of you and from there arranged to visit schools…I hope as many of you as possible can make it….it would be a preview of what I will do at your school…and so much fun to see you…. NASA is about to launch the coldest place on Earth - the Cold Atom Laboratory (CAL) - into orbit, where astronauts will use it to create never-before-seen conditions with temperatures 100 million times colder <https://www.jpl.nasa.gov/news/news.php?feature=6765> than the depths of space. A facility designed to fly aboard the International Space Station, the Cold Atom Laboratory, or CAL, will make use the space station's unique microgravity environment to observe quantum phenomena that would otherwise be undetectable from Earth. The laboratory will be available for use by multiple scientific investigators and is designed to be maintained on orbit. The Cold Atom Laboratory, which is scheduled for launch and installment on the International Space Station in April 2017, will also serve as an experiment in the use of laser-cooled atoms for future quantum sensors. SpaceX’s reused Falcon 9 first stage booster returned to a landing on an ocean-going platform a few minutes after launching March 30 with the SES 10 communications satellite, then returned to Port Canaveral early Tuesday. Standing more than 150 feet (nearly 50 meters) tall, the booster sailed into port around sunrise Tuesday after riding SpaceX’s landing barge from a point around 340 miles (550 kilometers) offshore Florida in the Atlantic Ocean. These photos show the first stage, which first flew in April 2016, completing its second mission with a braking burn by its center engine, then touching down on the drone ship. The second batch of photos show the vessel arriving at Port Canaveral. SpaceX technicians plan to offload the rocket from the barge for inspections, and the company intends to put the booster on display somewhere at the Cape Canaveral spaceport. This illustration shows NASA’s Cassini spacecraft above Saturn's northern hemisphere prior to one of its 22 grand finale dives. This artist’s concept depicts the early Martian environment (right) – believed to contain liquid water and a thicker atmosphere – versus the cold, dry environment seen at Mars today (left). 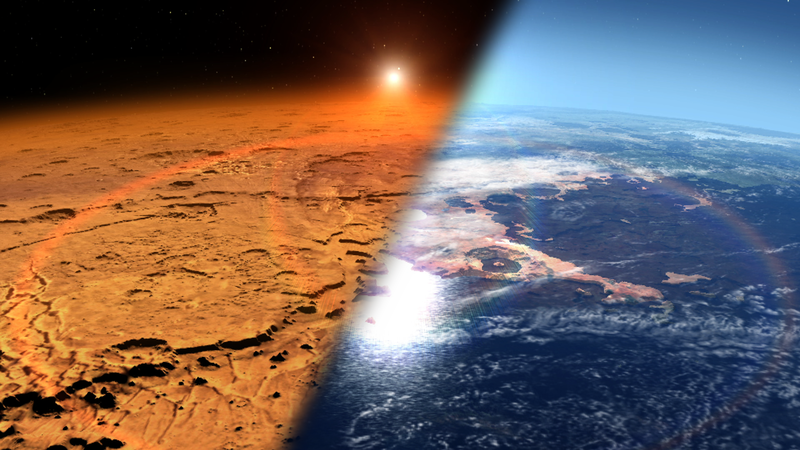 NASA's Mars Atmosphere and Volatile Evolution is in orbit of the Red Planet to study its upper atmosphere, ionosphere and interactions with the sun and solar wind. Solar wind and radiation are responsible for stripping the Martian atmosphere, transforming Mars from a planet that could have supported life billions of years ago into a frigid desert world, according to new results from NASA's MAVEN spacecraft. "We've determined that most of the gas ever present in the Mars atmosphere has been lost to space," said Bruce Jakosky, principal investigator for the Mars Atmosphere and Volatile Evolution Mission (MAVEN), University of Colorado in Boulder. The team made this determination from the latest results, which reveal that about 65 percent of the argon that was ever in the atmosphere has been lost to space. Jakosky is lead author of a paper on this research to be published in Science on Friday, March 31. In 2015, MAVEN team members previously announced results <https://www.nasa.gov/press-release/nasa-mission-reveals-speed-of-solar-wind-stripping-martian-atmosphere> that showed atmospheric gas is being lost to space today and described how atmosphere is stripped away. The present analysis uses measurements of today’s atmosphere for the first estimate of how much gas was lost through time. Liquid water, essential for life, is not stable on Mars' surface today because the atmosphere is too cold and thin to support it. However, evidence such as features resembling dry riverbeds and minerals that only form in the presence of liquid water indicates the ancient Martian climate was much different – warm enough for water to flow on the surface for extended periods. 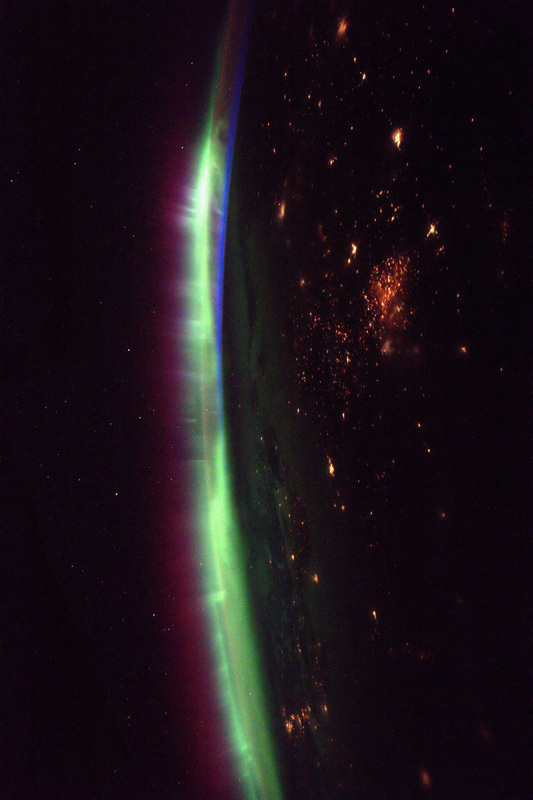 Expedition 50 Flight Engineer Thomas Pesquet of the European Space Agency (ESA) photographed brightly glowing auroras from his vantage point aboard the International Space Station on March 27, 2017. Pesquet wrote <https://twitter.com/Thom_astro/status/848262698487894016>, "The view at night recently has been simply magnificent: few clouds, intense auroras. I can’t look away from the windows.” The dancing lights of the aurora provide stunning views, but also capture the imagination of scientists <https://www.nasa.gov/mission_pages/sunearth/aurora-news-stories/index.html> who study incoming energy and particles from the sun. Aurora are one effect of such energetic particles, which can speed out from the sun both in a steady stream called the solar wind and due to giant eruptions known as coronal mass ejections or CMEs.